I quite admire the creativity of Bakers Cottage in coming up with beautifully designed decorative mooncake boxes. If not mistaken, Bakers Cottage started this years ago and enjoy very good mooncake sales. This is followed suit by other companies. Their boxes made very presentable gifts to give to someone like in-laws or anyone that value presentation. From left, the box can put 6 pieces of mooncake is sold for RM133.20, including the mooncakes. 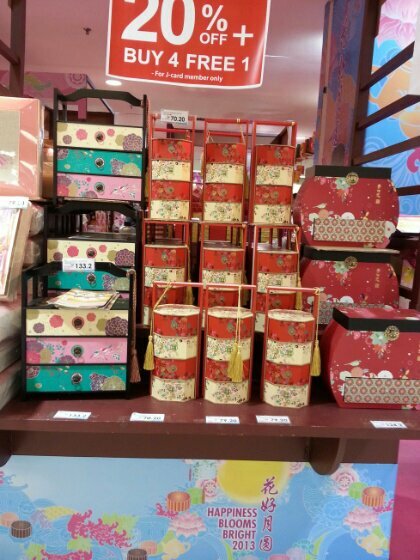 In the middle, the decorative box can put 4 mooncake and on the right, the box is RM124.20. This is displayed at AEON and there is a 20% discount which the AEON member card is required.